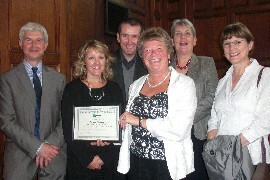 'Outstanding Governor of the Year' award, Denise Maloney, with the headteacher of Mayfield Primary School, Belinda Ewart and other members of the governing body. From L - R, David Scully (Chair of the governing body), Belinda Ewart (Headteacher), Councillor Colm Costello, Denise Maloney, Elizabeth Everett, Emily Bishop. Governors from schools in Acton and Hanwell were among those celebrated at the second Ealing Governance Awards on Thursday 21 July. The Mayor of Ealing, Councillor John Gallagher, presented the awards, which honour the hard work and achievements of the borough’s school governors. 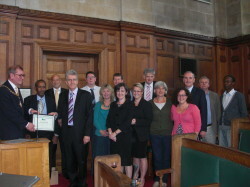 Acton High School’s governing body won the ‘Outstanding Full Governing Body’ award. They were recognised for the dedication and support they have given to the senior leadership team and the wider school following the recent early retirement of the headteacher. .
Ann Colgan, Acton High School’s deputy headteacher, said: “We have had an extremely difficult year after the early retirement of our headteacher due to serious illness. The ‘Outstanding Individual Governor Award’ was given to Denise Maloney who has been a governor at Mayfield Primary School for 17 years. She was praised for her work in leading the school’s recent sucessful building project, in the support she has given to the headteacher over the last year and for her work in mentoring governors at other schools. Belinda Ewart, headteacher at Mayfield Primary School, said: “Denise is a incredibly supportive governor who gives a great deal of time to the school. Two governors also received ‘Long Service’ awards. Elizabeth Boggust from Greenwood Primary School, Northolt, has served as a governor for 29 years. And Margaret Majumdar has chaired the governing body of St. John’s Primary School, West Ealing, for 25 years. Councillor John Gallagher, the Mayor of Ealing, who presented the awards said: “As well as congratulating our worthy winners, I would also like to take this opportunity to thank all of our governors for giving their time and talents for free. For more information about the work of school governors and advice on how to become one go to https://www.egfl.org.uk/categories/governance, email governors@ealing.gov.uk or call 020 8825 5444.